Curtis Brown’s one game in the majors came on May 27, 1973. He played left field for the Montreal Expos at Candlestick Park in San Francisco, going 0-for-4 against Ron Bryant. Less than two weeks later, the 27-year-old was sent back to the minors, never to return. For reasons unknown, he just didn’t have any support from Expos manager Gene Mauch. Brown originally came up in the New York Mets organization in 1965 (his younger brother Leon played 64 games for the Mets in 1976). He made it to Triple A in 1969, and if he hadn’t been hurt, he might have enjoyed some action with the Amazin’ Mets championship team. After playing in the U.S. minors through 1974, he then spent six summers playing in Mexico, sandwiched around one in the short-lived Inter-American League of 1979. All told, he was a pro for 16 years, including two seasons in Mexican winter ball.i The pleasant, easygoing Brown remained dedicated to baseball after retirement, especially working with youths – something else he shared with his equally jovial brother. Curtis Brown Jr. (no middle name, like brother Leon) was born on September 14, 1945, in Sacramento, California. His father was a construction contractor who built shopping centers and schools. Curtis Sr. and his wife, Ruby Banks, had four children. Before Curtis (the third) and Leon (the youngest), there was a brother named Willie and a sister named Nancy. Ruby also worked for a beauty supply company and in banks. During his first year as a pro in 1965, Brown played third base. “I was signed as a second baseman,” he said. “But I had a great arm. I played everywhere professionally except pitcher and catcher. I liked third base the best.” Although he liked the hot corner, his fielding percentage was much better in the outfield. His batting showed more promise, especially five homers and a .304 average in 68 games for Marion in the Appalachian League. Brown reached the Mets’ top farm club, Tidewater, in 1969. He played a good deal in the outfield, since Amos Otis spent a portion of the year with the big club. Otis also got hurt at one point – “he got hit by a pitch versus Syracuse. He stole second base, and the catcher’s throw hit him in the same shoulder.” However, Brown frequently served as the team’s designated hitter, a new role for him and baseball as a whole. That slot accounted for the majority of his 14 homers that year. He played in just 74 games, though, because a knee injury cut his season short. “In Syracuse, Roy Foster was playing right field and I was in center. There was a fly ball, and I called for it. His knee hit my knee as I planted my foot.” It’s interesting to note that Brown said he came to like right field the best. The 1970 season was largely a step back for Brown, who played just 12 games at Tidewater and 104 at Double-A Memphis. That winter, he went to the Mexican Pacific League, getting into 86 games with the Navojoa Mayos. He hit .235 with 7 homers and 29 RBIs, competing against his brother Leon and Dusty Baker, who were both outfielders for the Ciudad Obregón Yaquis. In December 1971, the Mets obtained veteran outfielder Jim Gosger – a former teammate of Brown’s at Tidewater in 1969 – from Montreal. In return, they sent four minor-leaguers – none of whom played even a day in the majors except for Brown. “I kind of got excited,” Brown said when asked about how he viewed the trade. Shortly thereafter, the Expos announced what they had in mind for him. Ahead of minor-league spring training in 1972, they scheduled a “school for thieves,” inviting 16 of their fastest farmhands to attend sessions on base running, base stealing, and bunting. Mel Didier, then director of minor league operations for Montreal, said, “We have speed in our minor league system and we want to utilize this to our best advantage. . .this special three-day camp will be a briefing on how to take the most possible advantage of their speed.”iii The most successful of these invitees was Jerry White, but Bombo Rivera and Pepe Mangual also played several years in the majors. Larry Lintz and Don Hopkins later became “designated runners” for Charlie Finley’s Oakland A’s. 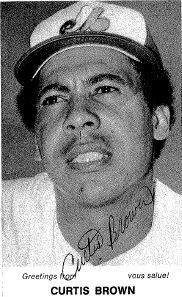 On May 22, the Expos purchased Brown’s contract after releasing Coco Laboy, whose major-league career then ended. Brown was in The Show at last. Montreal sportswriter Ian MacDonald called him “a veteran minor-league standout who has never been given a chance in the majors. Brown hits .300 or better all the time and was outstanding defensively with the Peninsula Whips last year where he earned 19 assists.”vi He effectively replaced Jorge Roque, an outfielder who had been demoted, and whose time in the big leagues was also over. Brown returned to Mexico in 1980, joining Poza Rica, and finished up with the Mexico City Tigres in 1981. In 556 career games in Mexican summer ball, he hit .298 with 29 homers and 229 RBIs. In spring 1982, aged 36, Curtis Brown retired from pro baseball. “My father got sick,” he said, “and I gave it up. They invited me down, and I said, ‘I’m done, I quit.’ They thought it was about money, they called me again after a while and offered more. I told them the same thing again. Joining FedEx had another benefit too: Brown met his wife-to-be, Dorinda “Dori” Schultz. “She was the first person I laid eyes on there. We’d have these annual dinners, but she always had a boyfriend and I always had a girlfriend. But we’d be looking at each other! Finally we got together, and we’ve been married around 14 years now.” The Browns did not have any children. This passion is visible in his zeal as a fan. When reached first for this biography, Brown had both the San Francisco Giants and Oakland A’s on television. “I’m usually here in my man-cave in the garage watching sports,” he said happily. He noted that the A’s and their opponent, the Seattle Mariners, were wearing throwback Pacific Coast League uniforms. “They look good!” he said. Grateful acknowledgment to Curtis Brown for his memories. Unless otherwise noted, all quotations are from telephone interviews with the author, July 8 and July 14, 2012). Special thanks also to Leon Brown for enabling contact with Curtis Brown. Continued thanks to Alfonso Araujo (Mexican Pacific League statistics). i Brown’s 2012 recollection was that he played three Mexican winter seasons, but Mexican Pacific League authority Alfonso Araujo’s research showed only two. ii Jack Ellison, “Pitchers Brace for Blast When Biff Swings Bat,” The Sporting News, November 12, 1966, 45.
iii Ian MacDonald, “Florida School for Thieves Latest Expo Innovation,” The Sporting News, December 25, 1971.
iv Bob Moskowitz, “Glassco and Forkball Blend with New-Look Peninsula,” The Sporting News, May 26, 1973, 35.
v Bob Moskowitz, “Valhalla Where Are You?” Daily Press (Newport News, Virginia), May 1973. Specific date is not available because this is a clipping from Curtis Brown’s scrapbook. vi Ian MacDonald, “Exposes,” The Sporting News, June 9, 1973, 21.
vii Ted Blackman, “Clown claims Riggs ‘welched’ on bet,” Montreal Gazette, May 30, 1973, 35.
ix John Cronin, “When a Dream Plays Reality in Baseball: Roberto Maduro and the Inter-American League,” Baseball Research Journal, Society for American Baseball Research, Spring 2011. See also The Sporting News, August 4, 1979, 47.